Families are like Chess...they come in all different shapes, sizes, and colors and each piece is important with it's own special skills and moves. 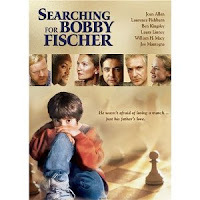 Searching for Bobby Fisher is a great movie for families, especially ones with kids in Jr. High or older (because this movie doesn't have enough singing and dancing to entertain the really little ones). This movie is about Josh, a young boy who is very good at chess. Get your house ready by decorating in black and white, the standard color of chess pieces. Put up some black and white streamers or balloons and let the family know you're serious about enjoying Family Movie Night. You could even pick up a checker-board (aka CHESS board) to go along with your dinner or Movie Snack. If your family doesn't know much about Chess then the perfect Pre-Show Planning will include going over some basics of the game. You can give a brief explanation of the pieces and how to win or go all out with a comprehensive lesson about the correct terminology and current Chess Champion stats. You decide how in depth you want to go! During the first tournament all the nervous parents are waiting around for the results. One of the other fathers offers to get Josh's Dad a tuna fish sandwich. Now is great Must-Pause-Moment where you can pull out your own tuna fish sandwiches, chessboard cookies or other Movie Snacks. Obviously an easy Family Movie NIght Activity to plan with this one is to actually play a game or two of Chess yourself. A great Must-Pause-Moment during the movie is to try your hand at speed Chess when Josh is playing for 2 minutes in the park. Set a timer and GO! Then see who ends up with the most pieces on the board when the buzzer goes off. You could also add some fun to the game by using other objects as pieces (think action figures, treats or random household items) or get a large enough group together and play chess outside using people as pieces. No doubt you'll be saying CHECK-MATE to boredom with this Family Movie Night Activity! Here's wishing you good luck with your game. Hope you enjoy Searching for Bobby Fisher.